Ventilated facade systems are developed to protect buildings against the environmental factors, giving the buildings finished appearance with high level aesthetic characteristics. 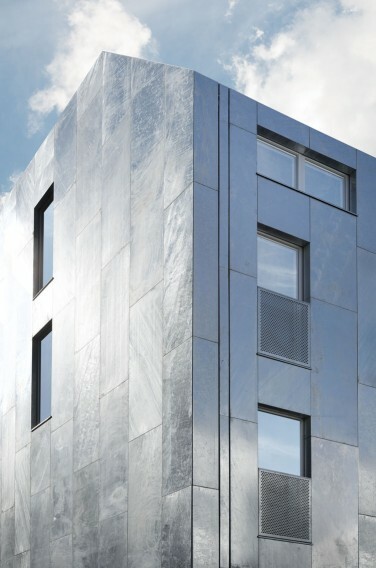 Ventilated facade cladding has a number of advantages with regard to heat insulation: it protects from thermal loss in winter and reduces heat in hot weather. The ventilated air gap between the cladding and insulation effectively discards moisture and creates natural ventilation. Ventilated facades can be used for new buildings and renovations of existing buildings. It is a great solution when individual design is required. Ventilated facades are durable and energy efficient. Depending on materials used – the period of design life can be up to 50 years. Ventilated facade systems are a complex structural solution which is hanged on the exterior wall. It consists of steel load bearing frame, brackets and profiles, exterior cladding panels. Our ventilated facade systems are easy to install, and installation can be done throughout the year. We also offer ventilated facade systems with non- visible fixings. Material of facade cladding: aluminum, stainless steel, copper, steel, zinc, metal sheets, metal composite, stone, cement fiber, composite sheet, HPL, ceramic tiles.